In website builder WebWave lightbox is a very similar element to a gallery, but with a different layout. In order to add lightbox to your website, select Image icon from the toolbar on the left side of the builder and choose the last icon. Add photos from the Media library or select files from your device. Change lightbox size however you want and photos will proportionally follow. Lightbox minimum size is only limited by its thumbnails. In the smallest lightbox size, all thumbnails are visible but there is no space between them. If you want lightbox to be even smaller, change thumbnails size. After clicking on your lightbox you will able to set in pixels lightbox's thumbnails width and height through "Lightbox size" section of side edition panel. You can also decide how thumbnails will be displayed in the lightbox. Choose crop type. "Crop" means that image will fully fit lightbox and might get cropped. "Fit" means that a whole thumbnail will be displayed but it might not fill the whole space. After clicking on lightbox you will see "Lightbox settings" in the Settings panel. Images in a row- how many images will be displayed in a row. Thumbnails animation - after ticking that box lightbox thumbnails will slightly enlarge when a user hovers over them. No image compression - after ticking that box lightbox photos will not be compressed when published. 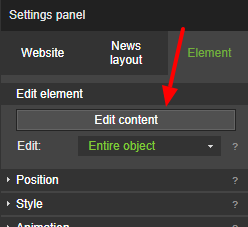 In order to add photos to a lightbox, click on it and select "Edit content". On the top of a new window select "Media library", choose photos and press "Add lightbox" at the bottom of the window. 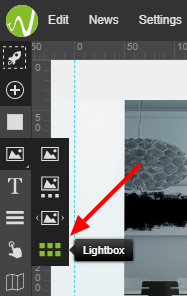 In order to remove photos from the lightbox, click on it and select "Edit content". 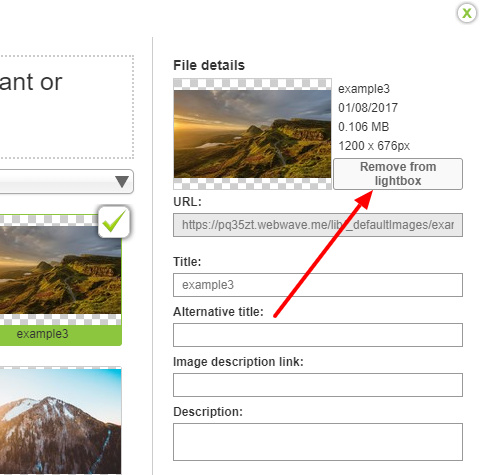 Select a picture which needs to be removed and in "File details" choose "Remove from lightbox". Click on the lightbox and select "Change content. In this window select a photo and drag and drop it in a place where you want it to be.